“Bunso” is a Tagalog term meaning lastborn. It is derived from the Malay term “bongsu” with the same meaning. It continues to be a common term of endearment for little children and babies. Earlier this week, my Family Tree app flagged a record where the names of both my maternal great-grandparents appeared. 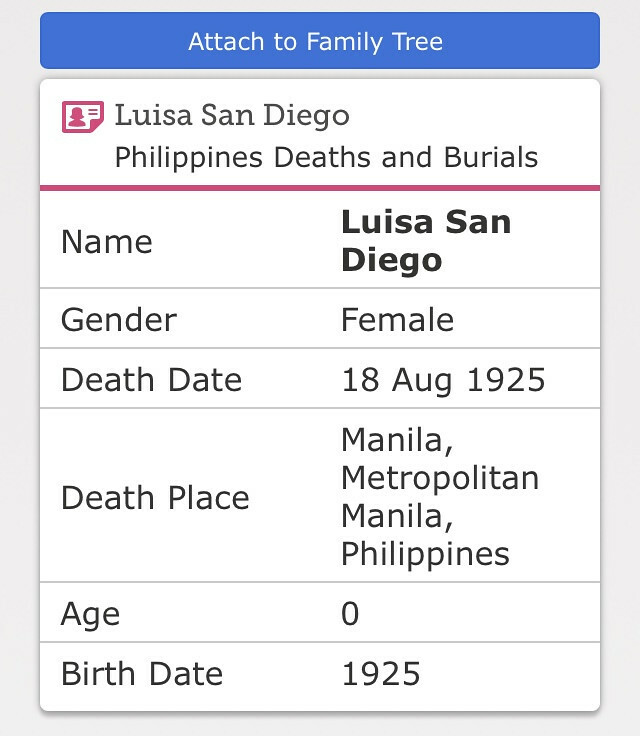 A birth record for “Luisa San Diego” who I have never read before; but who seemed, looking at the dates, was the youngest of my grandfather’s siblings. After a quick search on my phone, I saw another record that suggested she died barely two months later. After reading the historical documents (informant was a family member and the address matched), it would be safe to say, I found another San Diego grandaunt! 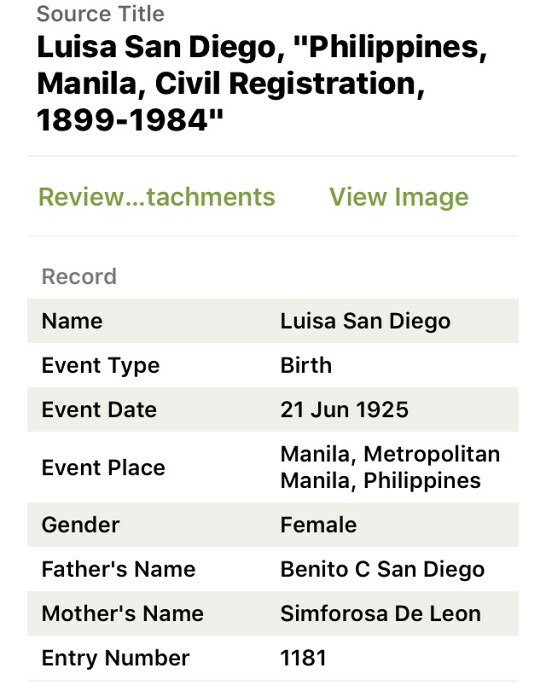 This felt strange and a little sad, because when I interviewed Lolo Nicanor’s “youngest” sister Concordia in the 1990s, there was a wealth of information on the family; but never any mention of a younger sister. I checked my interview notes, nothing! Then again, she would have only been around a year old at her sister’s death. Even after having spoken to my grandaunt about her family, it was foolish of the genealogist in me to assume there were no other details to be discovered. I have written in the past of the “forgotten” babies in our family. There are no family anecdotes about them. No one remembers their smile or laugh. They never made an appearance in family portraits. They don’t even have resting places we can visit. I lament how my grandparents could not maintain plots for their babies — either due to poverty or war. With so many children to feed or keep safe, perhaps they were expected to move on after a child’s death … maybe even forget. But chance and choices have a way of helping the next generations remember. My mom’s brother born 13 years and 1 week after Baby Luisa died was named Luis. And my sister Bernadette, our family’s “bunso” was born 44 years from the day Luisa became a cherub. And of course, there are those puzzling times when historical documents find their way to the desks (or in this case, the smartphones) of those who are paying attention. Please join me in saying a quiet prayer for my relatives who were never corrupted by age or time — forever babies — my Tito Edilio Magno, Tita Chrysantema Magno, Tito Efren San Diego and … Lola Luisa San Diego. Previous Previous post: The Search for Juan: Was Anderson a surname?